It’s December, so we’re full swing into holiday mode!!!! Christmas lights are clipped into our eavestroughs, our light up Santa got blown over on our front lawn, the usual! 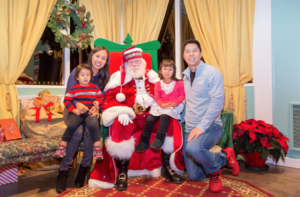 This year we started a new tradition, the Royal Botanical Garden’s Santa’s Signature Experience. My wife booked it after reading the rave reviews on a Facebook mom’s group, and the experience lived up to the hype. It included a return trip on The RBG Express (a train ride), hot chocolate and a cookie, storytelling and crafting with Santa’s helpers, admission to RBG for the day’s activities, and of course your visit with Santa. Santa’s Cabin was off the hook! It had a beautifully decorated fireplace, giant tree, and, the star of the show, Santa!! Santa asked my kids if they knew they had brought Christmas magic with them. My kids had no clue what he was talking about, but then Santa reached behind my daughters ear and illuminated a light within his glove between his index finger and thumb. The look of astonishment on my kids faces made me nearly lose my composure. I couldn’t have been happier with the experience, but my daughter had more in store for us. Mission accomplished!!!! Christmas can end now and I’d be happy. Part of our objective with our charity is to teach the kids to be selfless, and I believe the best teaching is done by showing, not telling. My daughter is not even 4 years old and she knows the meaning of Christmas. Proud parent moment!! Here she is with Anna and Elsa dolls (from the Frozen movie) we bought with our own money to give away on our personal deliveries. This podcast is brought to you by the Halton Real Estate Investors Group. The goal of the Halton REI is to entice would-be real estate entrepreneurs to get off the couch, make things happen, and replicate the success of our multi-millionaire clients such as podcast guests Charles Wah, Andy Tran, Evelyn, Kaush, Cherry Chan, Michal Wywrot and Tim Collins. Our track record of coaching highly successful investors is extensive and we share our secrets, tips and tricks at Halton REI meetings. So if you are interested in travelling the path of least resistance to real estate wealth without ever swinging a hammer than this is the place for you. Go to HaltonREI.ca/signup to register and do so quickly to avoid disappointment as we have waitlisted folks many times and seats are limited. One of the secrets of success is to surround oneself with successful people and in my ten plus years of attending workshops and networking events, this is one of the best places to be and I hope to see you soon. Gold Award & Economic Update Questions for Don Campbell and The RE Market in 2018?